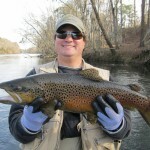 This 2013 winter fishing season could prove to be some of the best angling ever on the Chattahoochee River tail-water! 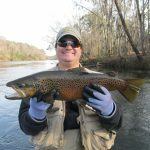 Many anglers have been disappointed this past 2012 during the fall through Christmas time frame because of the high flows released from Buford Dam making fishing and access almost impossible. These excessive flows were badly needed down-stream in the ACF watershed to help replenish water-tables with the 100 year drought conditions. The good news is that Lake Lanier is extremely low and it will likely take months for the Army Corp of Engineers to fill the lake to Winter & Spring-rule curve levels. 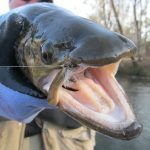 This means Buford Dam will release primarily minimum flows about 650 Cubic Feet per Second(CFS)** for the remainder of this winter making for mostly ideal and safe fishing conditions on the entire 48 miles of trout water. Please note that the Corps will release or “burp” the lake with the occasional one to three hour releases which will cause dramatic fluctuations (5 – 9feet water level rise and fall) during this time. 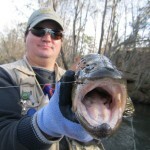 Please visit www.Atlantaflyfishingclub.org for a river safety flow chart. **Cubic Feet Per Second (CFS) – a rate of the flow, in streams and rivers, for example. It is equal to a volume of water one foot high and one foot wide flowing a distance of one foot in one second. One “CFS” is equal to 7.48 gallons of water flowing each second. For example, if your car’s gas tank is 2 feet by 1 foot by 1 foot (2 cubic feet), then gas flowing at a rate of 1 cubic foot/second would fill the tank in two seconds. We will have a float trip Saturday (1/12) from Jones Bridge to Holcomb Bridge. Be at the Fulton County side at 9:30am sharp. Bring your float tube, pontoons, etc. Jones Bridge also has plenty of water to wade for those who don’t want to float. As an added bonus, Ed Chamberlain (FFF master caster and AFFC casting guru) will be giving casting lessons starting at 8:30am (Jones Bridge, Fulton County side also). Come early for casting instruction and stay to fish! What more can you want? Since turnover has just ended, I would venture to guess that some of the flies that might work are y2k’s, zebra midge, copperhead soft hackles, Sawyer pheasant tails (and regular pheasant tails), blue assassins, lightning bugs, princes, hare’s ear, and maybe-adams and october caddis. Hang around after the trip is over. We will go out for some vittles! The Affc runs a special raffle each month along side a regular raffle. 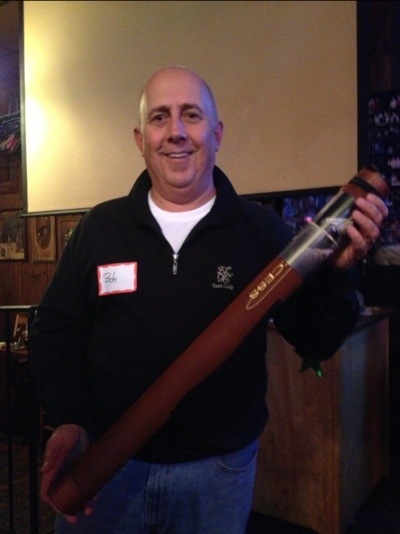 Bob must be pretty lucky as he won an axis orvis rod this month and in December. This past Monday and Tuesday I was lucky enough to be invited by Bob “NASCAR” Chambless to fish the ‘Tuck. What a great two days. We had at least 80 each but it was not the number that was the great attraction, it was the number of fish on a dry and the size of the fish. About half the fish I caught were on a dry (Adams). The first day NASCAR got a couple of nice 18-19 inch fish and I got a big boy ‘bow of 21-21 inches-on a dry! The next day NASCAR got two in the 20 inch range and I got one about the same plus a nice 17-18 in brown. NASCAR had never gotten fish this big this time of year on the ‘Tuck. I recommend having some October caddis, Adams, black zebra midges, Sawyer pt’s, Cousin Pat’s secret fly, blue assassin, and the PB midge. Jackpot on the Saluda River! Hey Guys, I trust you all had a safe, meaningful, and enjoyable holiday season. 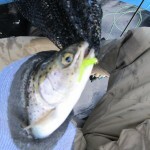 My time off was made more special by the trout I caught on a guided fishing trip with Michael Frank, again. I was home (Columbia, SC) for the Christmas, so I hired Mike to take me and buddy out on the Lower Saluda River (below the Lake Murray Dam). In short, JACKPOT! I landed a 22″, 4 lbs 10 oz. brown trout. 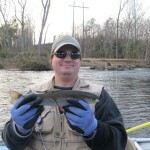 It was the bigges trout known by the guide to be taken from the Lower Saluda. It actually broke his record of a 21″ brown. The guide said it was the biggest brown he had seen taken on the river. Fishing is mostly from a raft. This is one of Craig Reindau’s chartreuse Wee Willie Wigglers. I caught several rainbows, too. Two were tagged by the SC DNR. I plan to submit the tag numbers to the DNR for accoutability purposes (as requested by the DNR). Plus, I caught one bow on one of Craig Reindau’s chartreuse Wee Willie Wigglers. I included two pics of it, too. See you next Wednesday. Happy 2013! Many anglers pursing this sport realize that fishing and other outdoor activities have a certain element of danger. Some anglers take great care in anticipating potential sources of danger; others pursue the sport with little foresight and may find themselves in potentially dangerous if not life threatening situations. The angler should take extra precautions when engaging in such activities. It is important to be observant of your surroundings, not take risks, and plan ahead. I was reminded of the importance of safety many years ago as a young man when I almost drowned while trout fishing in the Chattahoochee River, north of Atlanta, Georgia. During this time period, I was working in the Georgia public schools and had extended time during the summer months to fish on weekdays when waters were less crowded. I was fishing downstream from the Jones Bridge area of the Chattahoochee River, beyond the sound of sirens at Lake Lanier’s Buford Dam warning of water releases from the dam. I neglected to obtain the day’s generation schedule from the Corps of Engineers at Buford Dam. Though fishing with a friend on this particular trip, he was fishing another section of the Chattahoochee River. Over the course of the day’s fishing, I waded to some small islands and gravel bars located in the middle of the river. Getting to these gravel bars, I had waded across the gentle current of the river’s main channel with water being above my ankle but below the knee. I had laid a small waist tackle bag on the gravel bar while fishing the bar’s riffles. After a period of time, I observed the tackle bag beginning to float downstream. Retrieving the floating bag, I noticed that the river’s current had increased considerably in velocity. I returned to where I had entered the river and attempted to cross the river’s main channel on the Fulton County side. However, by this time, the water was now rapidly rising over my waist. If I had picked up my foot to walk across the main current, I likely would have been swept downstream, filling my waders with extremely cold water. Instead, I slowly inched my foot along through the gravel and small rocks on the river’s bottom to the river’s bank. When finally reaching the bank, the water was up to my chest and rapidly rising towards my shoulders. Over the course of my return crossing of the river, several tackle items were swept away by the torrent that was now the Chattahoochee’s current. As a result of this frightening experience, I learned many lessons in preparing to fish not only a tail-water river but other types of waters. I began to use a wading belt to prevent water from entering the top of my waders, fishing with a partner, being alert for rising water, and making contacts to determine the water release schedule. The angler can develop a safety plan and attempt to anticipate potential problems. One can search the internet or make telephone contacts to obtain information regarding generation schedules as well as figuring out when high water would reach the angler’s location on the water. Having available and programming a cellular telephone with various emergency telephone numbers would be invaluable. Inform others of your fishing location and time schedule as a means to prepare for an emergency situation. The Atlanta Fly Fishing Club is advocating for Project River Rising. This project along with other advance preparations can be the difference between life and death for the angler. NASCAR Bob Chambliss asked Ed and I to go to the AMI on 12/28. It was a pretty cold day with pretty chilly water (around 45). The fishing was pretty good but sporadic, you would go on a run then it would shut down. Saw Ed and NASCAR fishing underneath the bridge and Ed was getting a fish on about every cast-it made NASCAR jealous!!!! Ed was kind enough to leave and I took his spot and only got only 2 in about an hour of fishing. Off and on fishing. And speaking of on-Ed got one of the biggest, if not the biggest ‘bow (look at the pictures) I have ever seen outside of the pellet farms. This bad ‘bow was around 21 to 22 inches and THICK, reminded me of Budcan. I finished with around 18 and got to use my new Scott S4 rod, of which I was very impressed. I’m sure NASCAR and Ed got at least that many (it seemed like Ed pulled 8 or 9 out of that one hole). Be careful wading this time of year the water is cold-ask Ed !!!!!!!! Milton Sams and I left Atlanta on Saturday August 21 for a week in Alaska. We flew Delta direct to Anchorage and then took a Dash 8 operated by Era Airlines to Kodiak arriving at 11:00 PM on the last flight of the day. After getting our bags and finding out that the Best Western’s shuttle driver failed to report for work that day, we began the process of locating a taxi. About 11:45 they turned out the lights and locked up the airport terminal leaving us and our bags standing outside. The taxi came at midnight and delivered us to our hotel, about 5 miles away. For weeks whenever I told anyone that I was going to Kodiak the first comment, without fail, was, “don’t get eaten by the bears.” I had come to expect that from people in Atlanta but I was not prepared for the Kodiak taxi driver to immediately tell us that the authorities had just killed a bear that had become an aggressive nuisance. I assumed that the Kodiak locals would be rather passé concerning the bears. At 7:35 AM on Sunday Doyle Hatfield, co-owner of Saltery Lake Lodge, called to say that it was too foggy to fly. We were to have been picked up by the lodge’s float plane for the 20 minute flight to Saltery Lake. Doyle said that they would pick us up at 11:00 and drive us to the lodge, so we headed to breakfast. As we sat down to the hotel’s breakfast, enjoying the view of the harbor through the rain and fog, in walks Tyson Reed! Here we are on an island 3,800 miles from Atlanta and we meet an AFFC member. Our club members sure get around! Tyson and his boss had been on business in Anchorage and came to Kodiak for the weekend to do a little fishing. Oh, they did plan to make some prospecting calls while they were there. Doyle met us in the hotel lobby and shortly thereafter his business partner, Bill Franklin, pulled up in a well used Chevy suburban. The lodge is about 30 miles from Kodiak, the first 12 miles are on the highway and the last 18 miles are over what could generously be described as an ATV trail. It seems this “road” was built by Seabees during World War II. It was abandoned shortly after the war and has been unmaintained since then. To give you a sense of the road, it takes two and one-half hours to cover the 18 miles. It was amazing what that jacked-up, four-wheel-drive suburban could drive over or through. Bill pointed out that their lodge was the only lodge on the island that could be reached by land. All of the other lodges are fly-in only and their expected guests were left sitting in Kodiak until the next day. This is one of the conditions that pressures bush pilots to fly in marginal weather and contributes to the high accident rate in Alaska, which is twice the national average. The road seemed like a good idea to me. Incidentally, that very day a Beaver, carrying three park service employees and a pilot, went down and had not been found a week later when we left. We arrived at the lodge and as we were taken to our cabin to settle in we saw a bear swimming across the lake. We had a quick, late lunch and Geoff Abramczyk, our guide for the week, led us on the short walk to Lake Creek where we fished for Dolly Varden trout for a couple of hours before dinner. As we came out of the bushes on the edge of the creek we happened upon the bear that we had seen swimming. She was finishing off a sockeye salmon and ran away as we approached. Geoff said that she was a three year old cub that liked to hang around the lodge. She looked big to me. The lodge is located on the shore of Saltery Lake, a clear 20 acre lake surrounded by mountains. The lake is fed by Lake Creek and empties into the Saltery River. The river flows about two and a half miles to Ugak Bay. The salmon; first the sockeye, then the pinks and finally the silvers, swim up the river to the lake where they stage for a while before they swim up Lake Creek to spawn. The silver run was just beginning. Lake Creek is small water by Alaska standards…about the size of a large Smokey Mountain stream. It was filled with bright red spawning sockeye salmon. I caught several Dollies using the same bead technique that we used on my trips to the Kenai River, although these fish are generally smaller; in the 12 to 18 inch range. As I fished my way upstream I saw the second bear of the trip and even at 50 yards he looked really big. He paid no attention to me and just kept fishing. I paid attention to him and quit fishing. Monday was a clear and sunny day. We went to the lower Saltery River where I caught 5 chum salmon, two were quite large. In the afternoon we caught mostly Dolly Varden. I did get one small silver salmon. Tuesday was another clear and sunny day, quite unusual according the lodge staff. After breakfast we noticed a bear sitting on the shore of the lake next to the lodge’s boat; right in front of our cabin. We decided to spend the day fishing Lake Creek. Geoff said this was prime bear territory and as it turned out he was right. Milton and I caught Dollies all day; we must have landed 30 to 40 fish each. Some were quite large. We fished all morning then hiked back to the lodge for lunch. After lunch we hiked back to where we left off and continued to fish upstream. We encountered bears at regular intervals all day. We first saw a large boar (male bear). He was upstream and upwind so he couldn’t smell us right away. We hollered to let him know we were there and he stood up to get a better view of us before ambling off into the woods; quite a sight to see such a large bear raise up on his hind legs. Next a blond sow with two juvenile cubs appeared in the stream. The sow wasn’t aware of our presence and began to lead the cubs downstream toward us. We hollered and the cubs heard us and appeared to be curious. The sow was oblivious and kept leading her family downstream. When we finally got her attention she turned and ran from the river with the cubs splashing behind. As if that weren’t enough, shortly another bear ambled out of the woods in about the same area. Once the bears cleared out we continued upstream and finally reached what appeared to be the end of the Dolly Varden water. On our way out we fished some of the best runs and holes with the goal of keeping enough fish to feed the lodge for lunch on Wednesday. We had not kept any to this point because we did not want to be carrying fish for very long in bear country. We quickly accumulated a nice string of 16 to 18 inch Dollies and, naturally, we encountered another bear. Geoff said it was one of the three year olds that have begun staying in the vicinity of the lodge. She was downstream of us, knew we were there, and was in no hurry to leave. She sat like a dog, scratching her ear and then laid down to take a nap, pretty much blocking our route downstream. We hollered at her for several minutes to no avail so I picked up a large stick and began beating on a log. This racket was sufficiently annoying to cause her to get up and amble into the woods; rather lethargic. We would encounter her again. As we came to the last run we planned to fish there she was; asleep on a gravel bar about 50 yards away from the stream. This particular run was guaranteed to hold big fish. It was a classic deep run under a huge fallen tree. I had fished it on the way up and botched the cast so I was determined to have another go at it. This time the cast was perfect and the fish was right where he was supposed to be. Hook up! As soon as the fish broke water for the first time I looked over my shoulder to check on the bear. She was no longer asleep! Apparently she just wanted someone to do the fishing for her. She stood up and took a step and I yelled. She stopped and finally laid back down about the time I landed the fish. That was my last fish of the day. Wednesday was once again a clear and sunny day. We went back to the lower section of the Saltery River hoping that more silvers had moved in overnight. I caught a big humpy (pink salmon) and then foul hooked about 20 more. That is the problem with the pinks. They are thick in the river and once they get into spawning mode they don’t seem to eat, they just manage to get foul hooked. After lunch we took the boat across the lake to the “bay”, as the lower end of the lake is called. I caught 3 silvers and 2 dollies and Milton caught 2 silvers, one of which was very large. We also feasted on Salmonberries that grow on the lakeshore; they look like raspberries and are very good. I wonder if they get their name because they are ripe when the salmon runs take place. We saw only one bear on Wednesday, the Oreo bear, so called by the guides because she had dark brown fur on the rear half of her body and blond fur on the front half and a dark head. Thursday was overcast, finally. We hoped for better fishing because under cloudy skies it is harder for the fish to see us. We went to the “bed springs” hole in the middle Saltery River looking for silvers. I caught a silver, several dollies and three rainbows. One of the rainbows was 18” which is pretty large for this river. According to Geoff this is one of the few places on the river where rainbows can be found. We saw one bear. She was upstream coming toward us. When she became aware of us she went into the woods and after a few minutes came out downstream, just as I was catching my large rainbow. After lunch we went back to the middle river below bed springs and caught more dollies and a couple of rainbows. Bill and Doyle came in Thursday afternoon and spent the night. Bill flew in and Doyle drove bringing four 55 gallon drums of fuel for the generator. The lodge and cabins have power 24/7 supplied by a generator and battery backup system that Nathan maintains. The lodge’s fleet of vehicles includes 4 suburbans, used by the guides and Nathan, two pickup trucks (I’m not sure if these even run) and a tractor. All of the suburbans and trucks predate 1995. These are the vehicles that stay at the lodge. There is another old suburban and a Ford pickup that are based in Kodiak but make supply runs to the lodge. Keeping these vehicles running, especially considering the abuse they take, requires a lot of mechanical know-how. Bill and Nathan do all of the maintenance; I get the impression that there is nothing they can’t fix. Bill began replacing the bearings in the front axle of one of the suburbans on Thursday afternoon. It turned into a multi-day project. He worked on it until about midnight on Thursday and a good part of the day on Friday. Nathan planned to finish the job on Saturday. People in Alaska have to be self-sufficient and pretty resourceful. Friday dawned foggy but by late afternoon the sun was out. We went to the lower river and I caught a couple of pinks and a big chum. Just before lunch we went to the “lower hole” which is actually at the upper end of the river, above the weir and just below the lake. No fish, but we saw a bear on the other side of the river. After lunch we went back to the bay and it was dead so we went to the mouth of Lake Creek. I caught my first arctic char; the first of several. They look very much like dollies (which are char) but they also look like big brook trout (which also are char); they have the same white markings on the lower fins. I also caught a few dollies and Milton must have landed 20 good sized dollies in the span of an hour. Bill left after dinner on Friday to fly back to Kodiak. We all went out onto the lawn to see him take off. In about 5 minutes he was back. There was a problem with the trim setting on the plane. Out came the tools and after a quick check Bill determined that the jack screws that adjust the trim were stripped. He was able to get it locked into a “nose up” setting that would enable him to fly back to Kodiak with a lot of physical effort pushing down on the controls. It did not seem likely that Bill would be able to pick us up in the plane on Saturday morning. It probably did not matter because Saturday dawned foggy and Milton and I had an 11:25AM flight out of Kodiak. We had to begin the 3 hour road trip into Kodiak by 7:45. The ride was no less arduous the second time. I had a six hour layover in Anchorage before my non-stop flight to Atlanta left at 7:35PM. Milton’s flight to Salt Lake didn’t leave until 1:20 AM Sunday; he had to hang around the Anchorage airport for 13 hours! Ugh. Milton was going to Billings, Montana to meet his brother for a few more days of fishing on the Big Horn River.